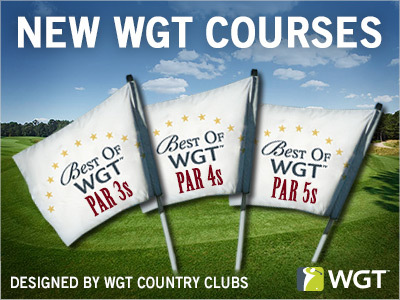 See what’s new on WGT today, including three "Best Of" courses, Cobra virtual drivers and new Virtual Tour winner icons! We've added all new Best of Par 3, Best of Par 4 and Best of Par 5 courses, to include WGT courses that we've added recently. Get the latest driver from Cobra on WGT, for more distance and a slower WGT swing meter, to help you hit straighter and longer off the tee! 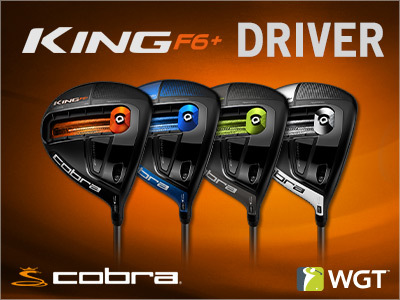 The new Cobra F6+ virtual driver is available now in the WGT Pro Shop in blue, green, orange and white, unlocking at Level 5. New in the 2016 WGT Virtual Tour, each monthly tournament winner (in each tier) will display a new crown icon next to their player name, to let everyone know they’re the reigning Virtual Tour tournament champion. Additionally, each Quarterly Season winner (in each tier) will display a different crown for their reign. Both crowns will be reassigned to new (or repeat) winners at the end of each month or Quarterly Season. Removed Stand Bag Plus – We've removed the Stand Bag Plus from the Pro Shop, if you had one before the release you will still be able to use it and congrats – you're now a vintage WGT collector! MisterWGT: "WGT and TOPGOLF are now one!" Greetings fellow WGTers! It's been an exciting few weeks and many of you have been asking, "Where’s MisterWGT?" Well I am thrilled to say that I, along with all the staff at WGT, are now part of the Topgolf family! Naturally this raises a number of questions… so let me take a moment to answer. Wait! What?! Who is Topgolf? Put simply, Topgolf is not a historic country club with massive dues just to walk in the door. 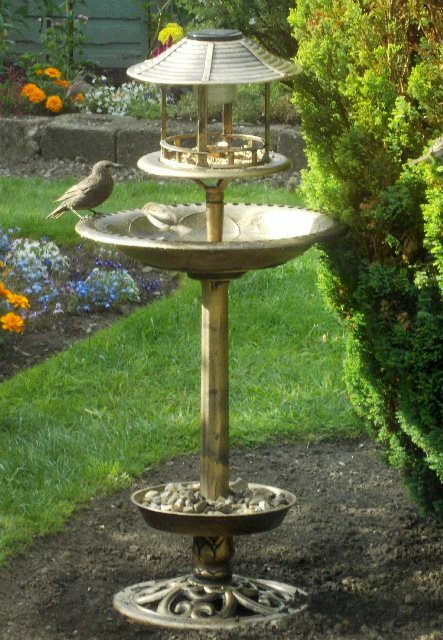 It's a place for everyone. 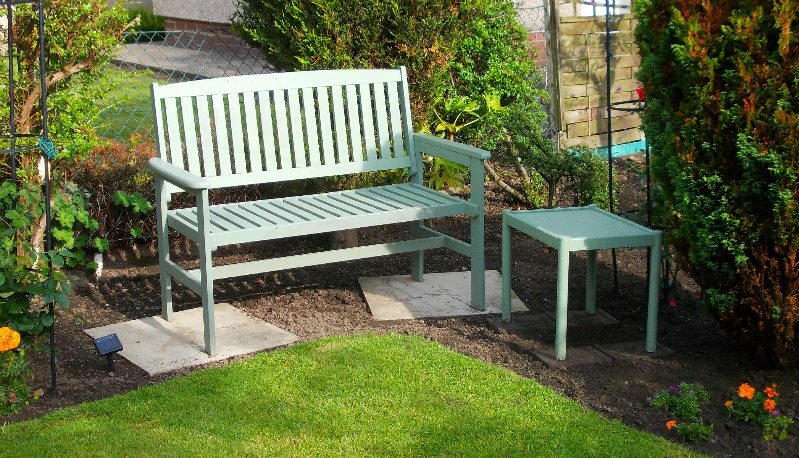 It’s a place to laugh, enjoy and most importantly… a place to PLAY! This is what I've always wanted WGT to be as well. A "place" where anyone in the world can go to socialize, play and enjoy this amazing sport that has spanned centuries. So we decided to merge our goals, our companies, and to redefine the world of golf for the next millennium! Ok… what does this mean for WGT? As some of you might know, this company has been my baby (quite literally as my 2nd child was born the weekend YuChiang and I founded the company). Over these last 10 years, the team we've assembled has done so much to help turn what was merely an idea into a 14-million player reality. Thus it was incredibly important to see WGT continue to flourish & grow. 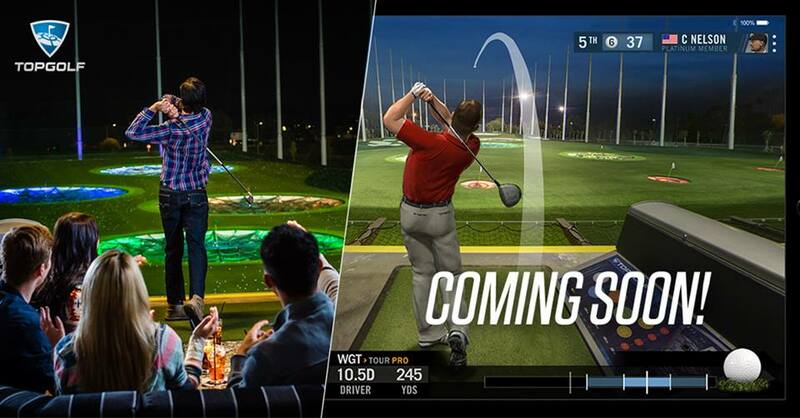 Topgolf also recognizes this and combined we are dedicated to adding new features, new content and courses. Our multi-year commitment with the USGA is going strong and we’ll continue running the Virtual U.S. Open. In fact, we are already underway with pre-production of Erin Hills. And although I cannot reveal all our future product plans, what I can say is that we are working on a Topgolf driving range experience for mobile as I type this post. So to be clear… WGT is not going away and we are doubling down to make it stronger than ever! And if you still don’t believe me, be sure to check out our joint press release from the PGA Show. There's tons more I'd love to share, but in time. I must sincerely thank the entire player community for taking a chance with a company who was looking up at the sports/gaming mountain and thinking, "Yeah… we can top this!" Without you, we'd still be at the bottom staring at the summit. Also many thanks to Icon, Tibbets (remember him?! ), WGTAlex (remember her? ), Nivlac, BolloxInBruges, mrcaddie, mrenn29… and who could forget Yancy?! Lastly, if any of you have been to a Topgolf venue, please share your impressions with the community -- and – let us know what you liked about the experience & how we can recreate it in WGT! We have some big news -- WATCH LIVE! We're announcing something big... Watch the live press conference! 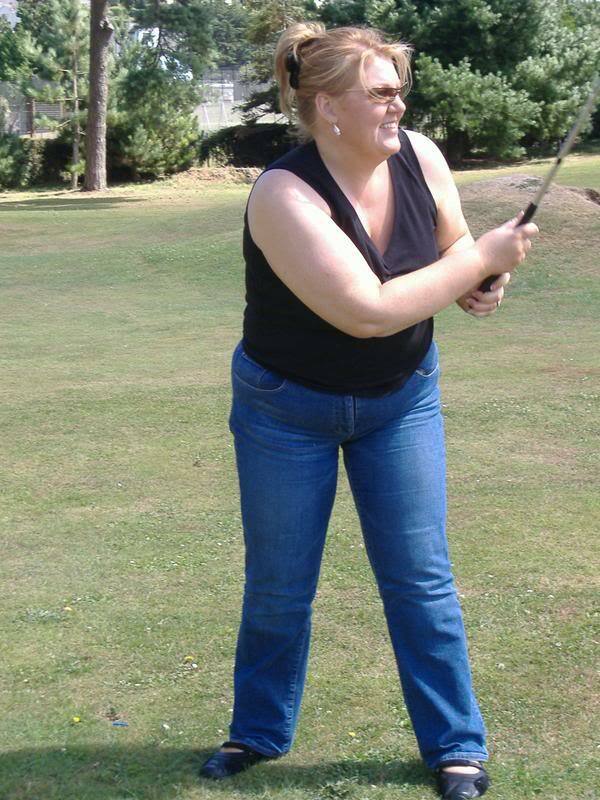 Known as Sue outside of WGT, this Level 92 Legend joined World Golf Tour in the Spring of 2015. She was introduced to the game by her husband, saying, "...he dragged me along as something to fill my days while incapacitated." She is a dedicated WGT Country Club owner for the Craven Dale Country Club and her husband is the director. (Talk about teamwork!) When she isn't tending to her country club you can find her working on her garden or on eBay. Her first job was potato picking at 13. She writes a blog and recently sent it to Richard Branson (successful businessman and investor), who "provided a complimentary trip to London, with luxury afternoon tea, complimentary visit on London Eye, complimentary hotel stay, and rubbed shoulders with Ronan Keating and George Clooney down the red carpet at the premiere of Tomorrowland!!" WE WANT TO GET TO KNOW YOU! If you'd like to be featured, or know someone who should be featured, in an upcoming "WGT 19th Hole" profile, please let us know at: players[at]wgt.com. Here's a special offer to help get you through the week: get 3 free MAX virtual golf balls when you buy 2,000 or more WGT Credits. You're so close to the weekend! Get there a little faster with a WGT golf break. 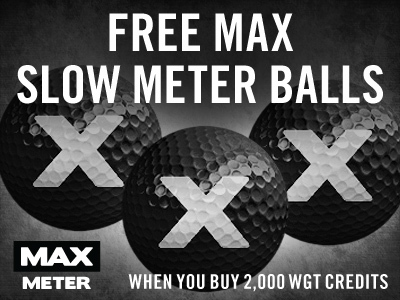 Through tomorrow, you'll get 3 free MAX Slow Meter balls when you buy 2,000 or more WGT Credits. These are some of our most popular balls on WGT, giving you good overall distance and a slower swing meter. Plus, Amateur tier players and higher will get the MAX Slow Meter Vapor balls with gold vapor to better follow your shots in the air. Use your WGT Credits to upgrade your virtual equipment and compete in paid games for prizes. Just buy 2,000 or more WGT Credits today through tomorrow (1/21/16-1/22/16) on WGT Golf, and get 3 MAX Slow Meter virtual golf balls (Hack) or MAX Slow Meter Gold Vapor virtual golf balls (Amateur+). Offer valid on one 2,000 or more WGT Credit purchase only. Note: The free virtual golf balls will automatically be added to your inventory but not automatically equipped. To use them, just open your Equipment and equip the new MAX balls from your inventory. Staying inside to avoid the cold weather this week? Great! No need to brave the elements to represent your country club in CC Event #16 – going on NOW through Thurs, 1/21. 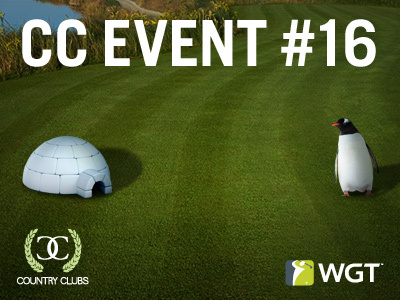 Compete against other WGT country clubs for in-game rewards, club pride and igloo/penguin tee markers and flags. 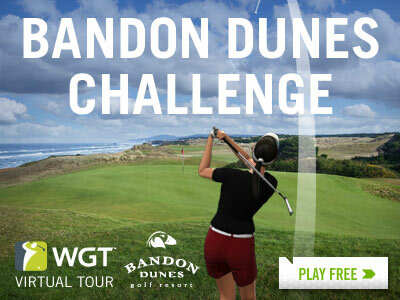 You still have time to play the Bandon Dunes Challenge tournament, the first of the year in the 2016 WGT Virtual Tour. Post your unlimited play first round score by 1/26, then compete in the single-play second round, 1/27-1/31, to determine your final score. The top 70 combined scores in each tier will split the total credit purse and NEW in 2016, the winner of each tier will display a new icon next to their player name, letting everyone know they're the current reigning Virtual Tour tournament champion! When each monthly tournament ends, the winner in each tier (Pro-Champion) will display the new winner icon next to their player name for the next month when a new winner is crowned. Players can keep the icons for multiple months – but only if they keep winning. Watch for these reigning champs throughout the year! We're bringing back the popular "WGT 19th Hole" series, focused on featuring the players, personalities and country clubs that make up the global WGT community. 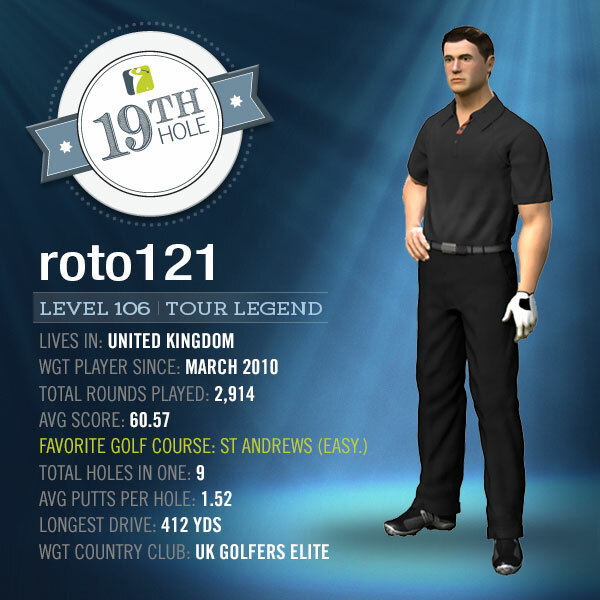 roto121 is an active WGT player and a veteran in the WGT community. In fact on 12/22/2015, he reached 1,900 consecutive days played on WGT! Known outside of WGT as Jim, roto121 lives just outside St Andrews and is "lucky enough to work in the big red building behind the 18th hole [at St Andrews], although it's changed a bit since WGT photographed it." "I am lucky enough to have this view every day at work." "This was taken about six weeks before this year's Open and shows the humps and bumps on the 18th fairway compared to the flatness of the 1st fairway." "Here is a wee bit of fun, this is just next to the 2nd tee/2nd fairway, so it's not just all about the Old Course as this is a must play when in St Andrews also. "This is something I was proud to achieve and still am, as it gave me membership to a very exclusive club at the time." How did you hear about World Golf Tour? "I came across WGT in March 2010...but then saw it was advertised on the R&A website for the 2010 Open and thought there must be more to it if they are involved. The rest is history as they say." What equipment is currently in your virtual golf bag? "In my bag I still have the Satin 64 50 yd wedge, as I love the 41 yd punch on it. And the old favorite Rossa putter, I'm not the best putter in the world but it's the only putter I have felt comfortable with." What advice would you give to new players starting out? "Enjoy the game, make friends and join a club. I am a member of the UK Golfers Elite, and proud to be as it's very well run by the guys in charge (you know who you are)." Any last words you want to share? "To sum up WGT for me, I am not the best and never will be, but I keep on enjoying the game. I have made friends for life on here (still meeting great people yet) and have met some of them in real life for long weekends golfing the last 4 years – coming from America, France and Belgium, not forgetting the English and a Welshman." Oh, and about his consecutive days played record, he says: "My target was always to reach 2,000 but who knows, before you all jump on me, it's easy in this day and age to get online every day, am sure most of you do." 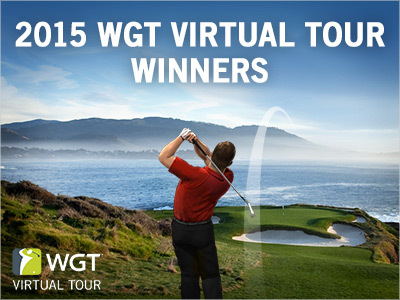 Thanks to all the WGTers that played the Virtual Tour this year, for making the 2015 season a success! The WGT Virtual Tour is a year-long competition played on WGT and covered on Golf Channel, where WGT players compete in monthly tournaments, accumulating WGT Credits and prizes throughout the season. And coming soon, the top two Champion tier players from the December New York Life Championship will compete in a live streamed match, so you can tune in and watch all the action as it happens. Stay tuned and check our Facebook and Twitter pages for more details! Didn't get to play all 12 monthly tournaments last year? Don't worry, the 2016 Virtual Tour season just kicked off and you still have time to post your first round score in the January Bandon Dunes Challenge! 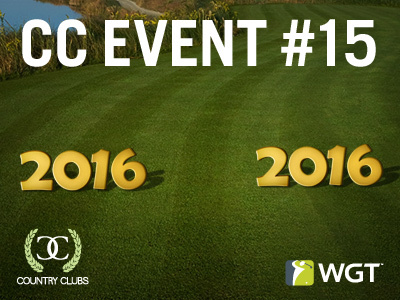 Give your country club something to celebrate by playing in CC Event #15, going on NOW through Fri, 1/8. Play today and tomorrow against other country clubs, competing for top leaderboard spots and in-game rewards including new "2016" tee markers and flags. Kick off 2016 with a CC Event victory!